Care: Hand wash with cold water and a mild detergent, hang to dry. Maximum Continuous Length: Approximately 35 Yards, when ordering more than 35 Yards please note it may come in more than one piece. Burlap is a fabric crafted from 100% jute. It's been around for ages, and it's very distinct. And it's certainly been around long enough for us to have figured out that it never goes out of style! That's because, time and again, it has proved its usefulness in a wide variety of applications. Sultana Burlap weighs in at a substantial 11 ounces, placing it in the heavyweight category. It's a tightly woven burlap, and comes in a variety of colors. The distinctive look, rough feel, and even the smell of burlap add a rustic, natural element wherever it resides. Why not ease into the world of burlap with this perfectly simple Natural Sultana variety? Perfect for sacks and bags of all types, unique window treatments, attractive wall coverings, innumerable craft projects, and even out in the garden, burlap is beloved by all, and for good reason! Whatever your burlap needs, we have just the thing! Making a slipcover for a bench. I chose this fabric because of its strength. Will use under foam on chairs I am reupholstering. Great web page, easy to use. I’m going to try painting on it. It seems like a tight enough weave with adequate weight. It's the highest quality burlap around! for it's tighter weave. Excellent for home decor & craft sewing. To cover my chair bottoms. this is a lovely neutral color which will go nicely with my branding. I tried regular burlap from the local Joann Fabric store and it is a much looser weave than this which is not really working for my crafts. I like the looks of this fabric much better - its a tighter weave and a beautiful fabric so I chose some in several colors to try. I've tried several different types of burlap and find the Sultana Burlap is a better quality and works better for my projects. Making Christmas napkin holders and centerpieces. This burlap is tightly woven and embroidery designs looks so nice on it. it works great with the craft projects. Using this to do a unique finish on a bedroom wall. This burlap had a close enough weave to be the perfect application for set design in our school's musical. We will be using it to drape and paint to simulate trees in a forest. Higher density weave than the burlap at my local fabric store. This burlap is by far the better burlap. It's a tighter weave and more professional looking than the regular burlap you find in stores. Great alternative! I chose the burlap fabric to make Canvases. Perfect for table cloths at my wedding. I have a cedar box garden for my deck. It does not have a bottom and I needed something to (a) "be" the bottom and (b) prevent the dirt from seeping out the bottom and between the slats. It also needed to be something that was natural and allowed drainage so the garden didn't rot. 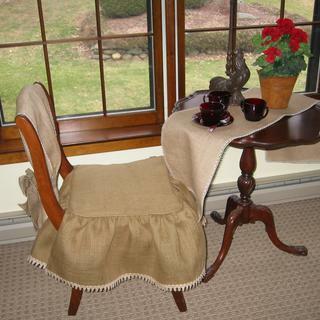 11 oz burlap is the best type of jute fabric to use when making home decor items such as pillows, drapes and chair covers. I prefer it over any of the looser weaves and the price point is very reasonable. Appears to be very durable and I am using to cover an ottoman/coffee table piece of furniture. Good reviews for what I want to use it for. i purchased this item to cover window box valances. To cover a table top. I received my sample and love the color and quality, but it seem that sizing of some kind has been used on the sample. Will the actual fabric have the same amount of body/stiffness? can i use this burlap to reupholster a chair? BEST ANSWER: I made a slipcover for a chair from this burlap. Turned out great. Easy to work with. You will need to use jeans needles to sew multiple layers. We don't recommend upholstering furniture with burlap, but some people do. 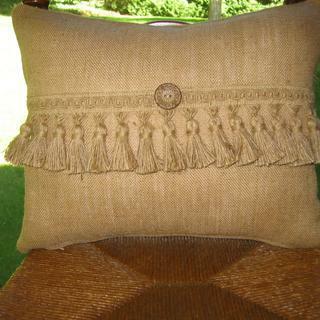 If you were to, this sultana burlap is the best option. What other colors can I get it in? how are the edges finished? BEST ANSWER: The edges are woven together. Is this too tight a weave to use for acoustic panels? In the description for the 10oz you say it’s good for sound panels. This here is 11oz. Is this fabric dense enough to make blackout curtains, or would I still need a liner? BEST ANSWER: Sultana burlap is denser than other burlap, but still lets light through. You will need a liner. I used it for craft purposes. Not dense enough for blackout use. I needed to wash a piece. It went very limp. Possibly dry cleaning would have been better. Thank you...then is there any advantage to using this fabric over a lighter-weight (e.g., 8.5oz.) burlap, if I would need to purchase liner fabric in either case? You would need a liner. It just filters the light. I love the look of the burlap. You’d still need a liner. What is the best burlap to use for drapes in home décor? Could the shedding be prevented by pre-washing the fabric? The Sultana is the best, because the weave is closer together and a higher quality burlap. If I were going to make drapes it's the one I would choose. I want to make curtains for my dining room, can I sew this on a reg machine ? BEST ANSWER: Absolutely, but you will need a heavier needle, size 14 will work fine. How wide is this burlap? BEST ANSWER: It runs 59" to 60". Can I use this burlap as a wall covering? BEST ANSWER: Yes, this fabric can be used as a wall covering. Thank you! I was concerned it might be too heavy. How are you planning on adhering it to the wall? Probably a liquid starch solution or cellulose based paste. We believe this will work, but you may want to test out a section before applying it to the whole wall. Can this burlap be run through a printer? BEST ANSWER: It depends on the printer. Since jute tends to shed, it's possible it could damage some printers. Sultana burlap would be the best choice since it has a tight weave. Is this soft enough and durable enough to upholster furniture? Does the material smell? Does it shed? BEST ANSWER: We do not recommend using this fabric for upholstery. does this come in 60 and70 in widths? BEST ANSWER: The width of the product is available only as 59/60" wide. Do you have a rub count for the Sultana burlap? BEST ANSWER: This fabric isn't tested for double rubs. Is this fabric sanitized? 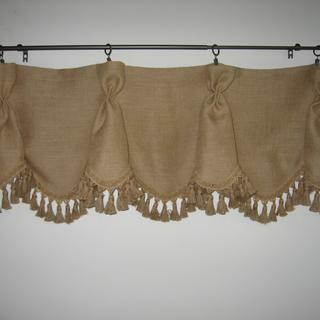 I am looking for burlap without the odor to use for table runners for an indoor wedding reception. BEST ANSWER: I doubt this has been sanitized. 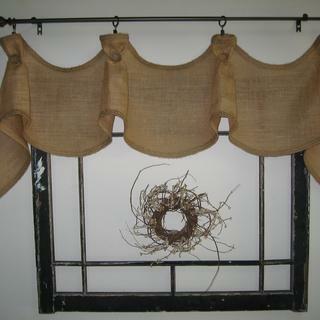 However, we have used many types of burlap and this is our favorite. It is low shed for burlap (low-shed not no-shed) and the odor is minimal. It is a premium quality burlap. I would use it for my daughter's wedding in a heartbeat. Which burlap would be best for pillows? is the natural sultana hydrocarbon free ? Great fabric to work with. burplap you can actually work with! I LOVE everything about this burlap! Nice weight and strength. Very easy to work with. I'm using it for upholstery but it would be perfect for accent pillows, light-filtering curtains, or crafts. It's not as rough and unruly as regular burlap but not soft enough for anything next to skin. "Natural" color is lighter than expected but I still love it. Next time I'm going to try "Idaho Potato Brown". 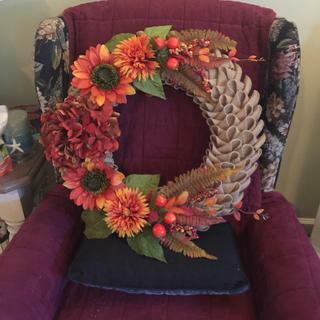 My first try at the Swedish petal wreath. Exactly what i expected. Price is so perfect. please don't increase the price after this good review lol. 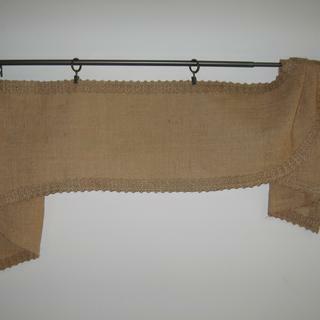 This burlap is high quality, dense weave, and a nice natural "burlap" color. Very pleased with the quality and the price is great. They did not have my 40 yards in one piece so my order was delayed and I did not receive notification, so I was a little frustrated over that, but all in all, I will definitely use Online Fabric Store again and I highly recommend the Sultan Burplap. I love the weave it is very tight together. Good quality, better than any other I have bought else where.